The underwhelming May jobs report disappointed in just about every way. Aside from the modest decline in the broader U-6 unemployment rate, there was not much to encourage the belief that hiring in the US was picking up steam. In my previous post comparing CES and CPS employment growth, I noted that the CPS employment number (derived from a household survey as opposed to the employer survey the headline CES number comes from) had been performing better than CES employment since both numbers bottomed in December of 2009. 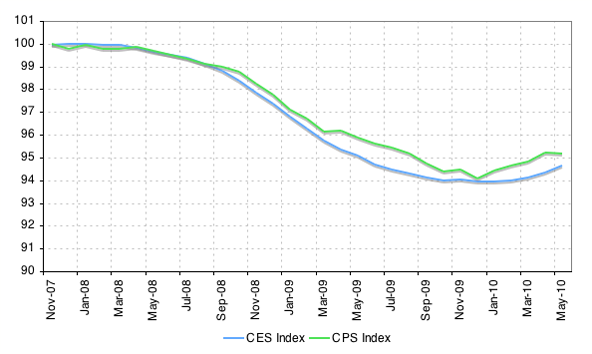 Unfortunately, last month saw a decline in CPS measured employment. Below is a chart of the two employment series which are set to 100 at their respective peaks. CPS employment is still up more from the trough than CES employment, but we certainly can't interpret last month's number in a positive way. And while the CPS survey is smaller and the resulting employment series noisier, strong job growth is more likely to overcome measurement volatility if we were in an actual strong job growth environment. In short, the CPS employment number didn't give us anything positive to pin our hopes on either.